When using heat styling tools it's important to protect your chemically treated/relaxed or natural hair as much as you can. For me, I cringe and actually feel a bit sick if no heat protectant spray is used before a curling iron or flat iron touches my hair. Since I hadn't been using heat styling tools for a while the heat protectant spray I had in my cabinet was old and needed to be replaced. This is where the Silk Elements MegaSilk Olive Heat Protectant Spray came in. After using the Silk Elements MegaSilk Olive Heat Protectant Spray when I curled my hair with a flat iron for a Christmas party I wanted to share my first impressions of the product. 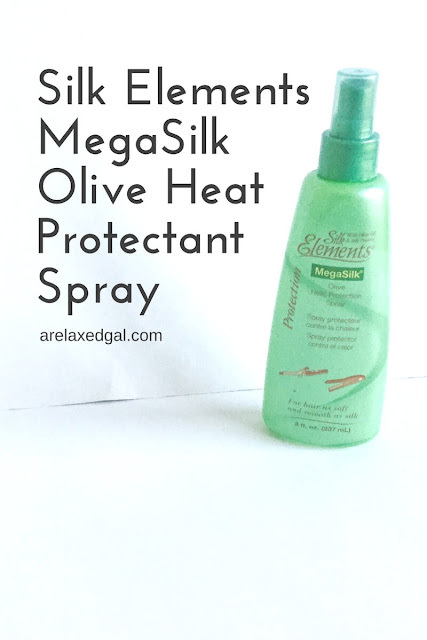 "Silk Elements MegaSilk Olive Heat Protection Spray is formulated with Olive Oil and Silk Protein, helps protect the hair from damage caused by heated appliances. This heat protection leaves hair soft and silky while providing a luxurious shine, can be used with flat irons, blow dryers or any heat styling tool"
"Spray Silk Elements MegaSilk Olive Heat Protection Spray on damp hair before drying or spray on dry hair before using any heated styling appliance"
"Cyclopentasiloxane, neopentyl glyol diethylhexanoate, amodimethicone, diisopropyl adipate, fragrance, olea europaea (olive) fruit oil, water, hydrolyzed silk, potassium sorbate, sodium benzoate, alpha, isomethyl ionene, amyl cinnamal, benzyl benzoate, benzyl salicylate, butylphenyl methylpropional, citronellol, linalool, benzyl alcohol." Check out this video to hear first hand about my experience using the Silk Elements MegaSilk Heat Protectant Spray. When you heat style your hair, what do you use for a heat protectant?